After walking on Bangalore’s or Benguluru’s fashionable M.G. road earlier this week I casually hopped into a bus at Anil Kumble circle named after the former Indian cricket captain. I was pleasantly surprised to find that the fare was only Rs. 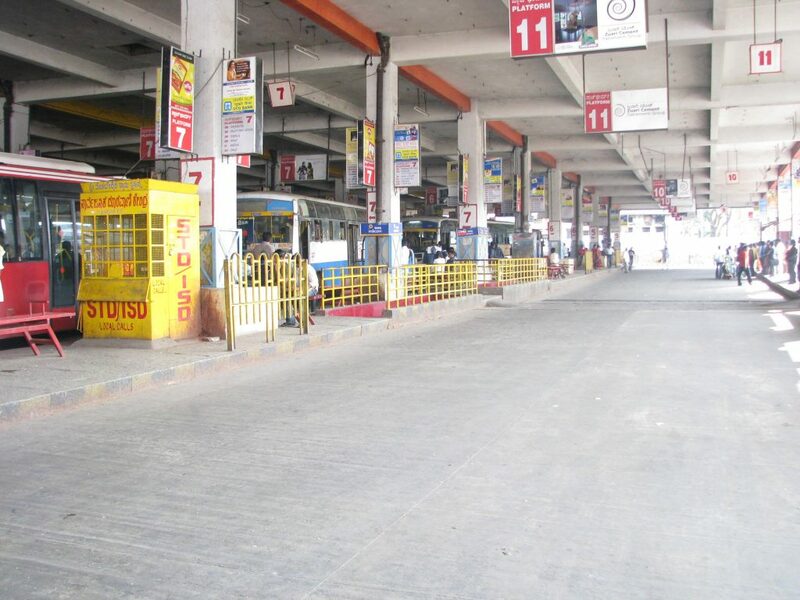 5 for Shivaji Nagar bus station. A distance of a little less than a km. but still the fare was quite low compared to Mumbai’s minimum fare of Rs. 8. More surprise was in store at Shivaji Nagar bus station. It was spacious with a lot of sitting space for commuters waiting for a bus, there were food kiosks and even a restaurant. There is nothing like it in Mumbai. Clearly, the Bangalore metropolitan transport corporation does a much better job than the BEST bus undertaking in Mumbai, runs many more buses, carries more commuters, its buses are much more visible and the service is known to even make a profit. In contrast, the government and the municipal corporation in Mumbai are totally neglecting the bus service. The neglect or even hostility is visible everywhere. While walking to Crossword book store at Kemp’s corner for Saeed Mirza’s book yesterday, I noticed this gross violation right outside the D ward municipal head office at Nana Chowk in one of the most historic areas of Mumbai. A municipal garbage van and a car blocked one bus stop and two cars blocked the adjancent bus stop. And this was right outside the well known St Columba girls’ school with its lovely heritage building. So,look at the disrespect to a girls’ school and to commuters. Municipal commissioner Ajoy Mehta constantly harps on BEST’s inefficiency and the BEST does need to improve. But the civic body’s and government’s negligence contribute greatly to its slide from the country’s prime and iconic bus service. The civic body is literally treating bus commuters like dirt and this happens all over. Our bureaucracy and politicians have badly let us down and they have also to learn a lot from Bangalore’s example, it has much better planning. Major transport hubs are close to one another on the same road, the KSR Bangalore railway station, the Majestic interstate bus station, the Majestic Metro station and the city bus station. At the interstate bus terminus it was a pleasant surprise to find even a modest hotel with reasonable rates for commuters. Mumbai could have done all this with a little imagination and planning. The usual excuse of lack of available space is a sham. There was enough land available in Mumbai for basic amenities. It was just frittered away. Bangalore also runs an efficient bus service from and to its lovely though rather distance airport and it is a bit costly at about Rs 240 per to Majestic, the focal point. The price could be easily be brought down, point out activists Srinivas and Shaheen. Bangalore also has a more elegant streetscape and much of the beauty comes from the solid, old trees with wide girth and foliage. Bangalore’s corporate and IT elite is intervening strongly in shaping the city. Good in a few ways and bad in many others. In Church street and adjoining areas in the colonial city, the footpaths have been widened and sanitized. Public funds are being used for boosting elite areas with intervention from groups like Jana Urban Space Foundation. Nithya Ramesh of this foundation took around some of us from the Sustainable Urban Mobility network after our three day session. Good showpieces and pleasant to walk on and then you realize the areas are not at all friendly to common people, by design common people are kept out as also hawkers. And all this redesigning is taking place at a high cost, Rs. 10 crore per km. Leo Saldhana, a forceful activist of the Environment Support Group, is very critical of elite intervention in Bangalore and calls for de-elitisation. It is absurd of the state government to invite CEOs like Narayan Murthy and Premji to remake the city, they may be experts in other fields, this is not their field and they must be kept out, he says. Constitutionally set up bodies are being bypassed in decision making in a most undemocratic way. He also opposes upper class campaigns for cycling tracks in exclusive areas and says cycling should be a democratic movement and it should be possible to cycle for common people everywhere, not just in specific lanes. The elite capture of the city has to be opposed. In comparison, Mumbai is more democratic, poshest aeas do have a good amount of space for small , humble shops and hawkers, despite periodic raids on the vendors. Mumbai’s elite is more callous than deliberately hostile, though in some cases it can be very anti-people. While footpaths are widened in fashionable areas in Bangalore, our inept government, civic body and the elite refuse to provide a basic facility as footpaths in prime areas like Malabar Hill and Pali Hill.